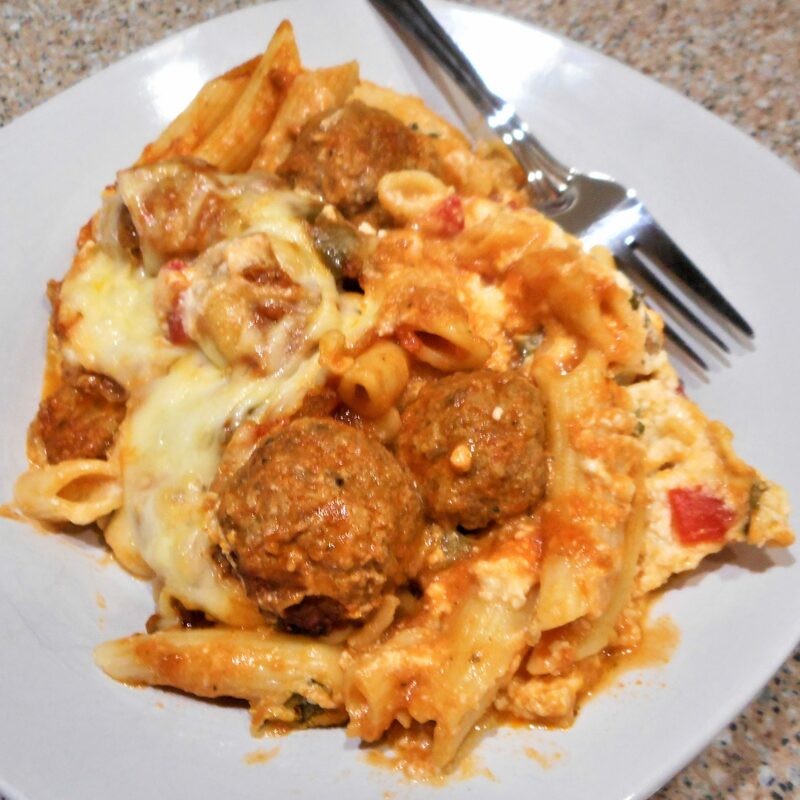 This family friendly casserole is best made with homemade meatballs, but the frozen grocery store variety can also be used. 1. Preheat oven to 375°. Lightly spray a 9×9-inch baking dish with cooking spray. 2. In a large Dutch oven, heat oil over medium heat. Add bell pepper, garlic and fennel seeds and cook, stirring frequently, for a few minutes until the peppers soften. 3. Stir in the tomato paste, then add the marinara sauce and ¼ cup basil. Bring to a boil, drop in the meatballs, and reduce to a simmer. Cook, stirring occasionally, for 10 to 15 minutes. 4. In a medium bowl, stir together ricotta, Parmesan, eggs, salt, and remaining basil. Gently stir in the roasted red peppers. 5. Drain the pasta and stir in 1 cup of the sauce. 6. Spread 1 cup of the sauce in bottom of prepared pan. Layer with half of cooked pasta, half of the remaining sauce, the ricotta mixture, the remaining pasta, the meatballs, and finally the remaining sauce. 7. Cover with foil. Bake for 30 minutes. Uncover casserole, and sprinkle with mozzarella. Bake until melted, about 15 minutes more. 8. Let stand for 15 minutes before serving. Garnish with more basil, if desired.